How to vertically center content with variable height within a div? What is the best way to vertically center the content of a div when the height of the content is variable. 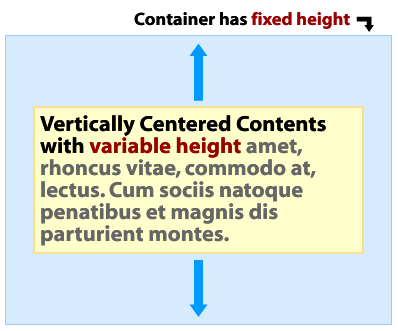 In my particular case, the height of the container div is fixed, but it would be great if there were a solution that would work in cases where the container has a variable height as well. Also, I would love a solution with no, or very little use of CSS hacks and/or non-semantic markup. What it does is moving the inner div's top border to the half height of the outer div (top: 50%;) and then the inner div up by half its height (transform: translateY(-50%)). This will work with position: absolute or relative. Keep in mind that transform and translate have vendor prefixes which are not included for simplicity. This seems to be the best solution I’ve found to this problem, as long as your browser supports the ::before pseudo element: CSS-Tricks: Centering in the Unknown. It doesn’t require any extra markup and seems to work extremely well. I couldn’t use the display: table method because table elements don’t obey the max-height property. This is something I have needed to do many times and a consistent solution still requires you add a little non-semantic markup and some browser specific hacks. When we get browser support for css 3 you'll get your vertical centering without sinning. For a better explanation of the technique you can look the article I adapted it from, but basically it involves adding an extra element and applying different styles in IE and browsers that support position:table\table-cell on non-table elements. Excuse me. What did you sleep in your clothes again last night. Really. You're gonna be in the car with her. Hey, not too early I sleep in on Saturday. Oh, McFly, your shoe's untied. Don't be so gullible, McFly. You got the place fixed up nice, McFly. I have you're car towed all the way to your house and all you've got for me is light beer. What are you looking at, butthead. Say hi to your mom for me. There are many ways (hacks) to apply styles in specific sets of browsers. I used conditional comments but look at the article linked above to see two other techniques. Note: There are simple ways to get vertical centering if you know some heights in advance, if you are trying to center a single line of text, or in several other cases. If you have more details then throw them in because there may be a method that doesn't require browser hacks or non-semantic markup. Update: We are beginning to get better browser support for CSS3, bringing both flex-box and transforms as alternative methods for getting vertical centering (among other effects). See this other question for more information about modern methods, but keep in mind that browser support is still sketchy for CSS3. You can use margin auto. With flex, the div seems to be centered vertically too. This is my awesome solution for a div with a dynamic (percentaged) height. Not the answer you're looking for? Browse other questions tagged css vertical-alignment or ask your own question. Vertically centering a div in body?